Understanding the similarities and differences among bodies within the solar system is a very powerful tool for unraveling their origin and evolution, and by comparison, for improving our knowledge about our unique Earth planet. Here we propose to describe, model and understand the magnetic environment of Mercury and its sources, internal (i.e., from the core to the lithosphere), or external (i.e., resulting from the interaction of the planet with the solar wind). These environments indeed bring crucial and otherwise inaccessible constraints to the internal structure and dynamics of the body and of its envelopes. Mercury is the smallest, innermost and possibly most enigmatic of the telluric planets. Prior to space age, its small radius and slow rotation suggested a frozen interior bearing no internal dynamics. The Mariner 10 mission shook this paradigm and showed that Mercury it is the only other known telluric planet besides the Earth with an active dynamo. Mercury indeed possesses a weak internal magnetic field governed by largely unknown processes. Its exosphere is populated by numerous species, with great spatial and temporal variabilities. The interactions of the internal field, the exosphere and the solar wind lead to a very dynamical magnetosphere, which in turn induces electromagnetic currents in the interior and exosphere. 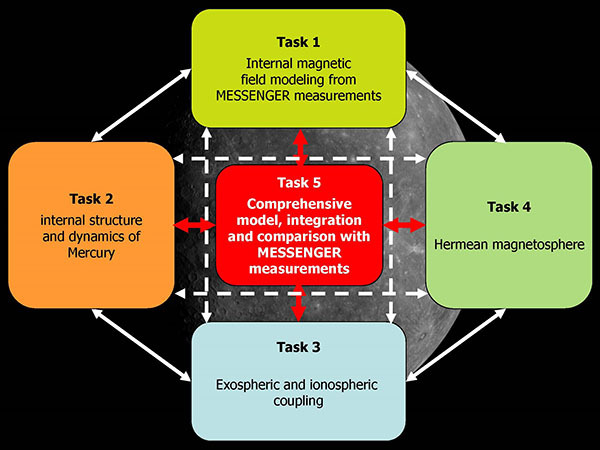 This research program proposes a scientific recipe, which will provide a new flavor for understanding Mercury’s structure and dynamics through the merging of tools which are traditionally dedicated to independent studies of the convecting core, the (thin) mantle, the surface, the exosphere, the ionosphere and the magnetosphere. This research proposal largely deals with the analysis of the NASA mission MESSENGER, in orbit around Mercury since 2011. We will develop theoretical and analytical tools to model the magnetic environment of a weakly magnetized body such as Mercury. This will especially contribute to a better preparation of our team for the next ESA-JAXA Cornerstone mission BepiColombo, to be launched in 2018. We could also consider applying such tools on other planets and moons like Ganymede, the Earth’s Moon, and Mars, to provide case studies for a better understanding of our planet.